Our parent company was first founded by Tony and Sheila Brazil in 1971 and has grown into a thriving business over the past forty years. 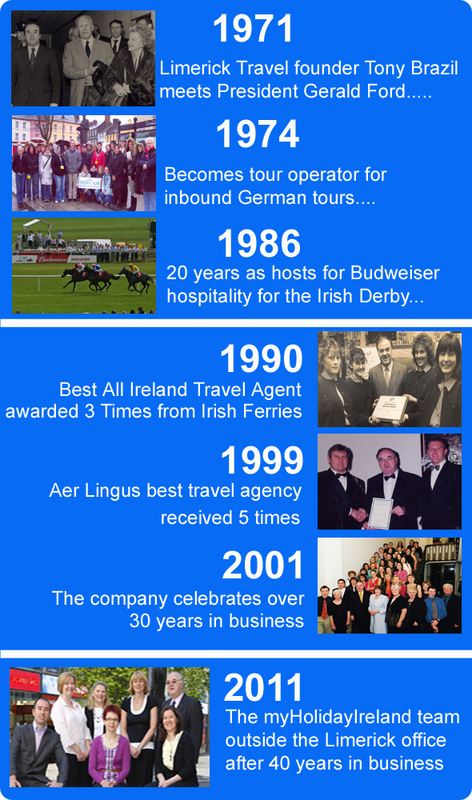 Located in Limerick City, the business is multi faceted dealing with all aspects of domestic and international travel. Our team of travel experts are dedicated in their research and exploration of new events, activities and services. Speak directly with your personal contact about your preferences & ideas and benefit from our experience and wide network of contacts. We will plan all aspects of your vacation to Ireland including accommodation, transport and leisure activities. As Ireland’s leading inbound tour operator, since 1971, our team of experienced Irish travel experts and vacation advisors have but one goal – to create that lifelong dream Irish vacation that you will remember forever. Whether you are interested in coach tours, self drive tours of Ireland or any other Ireland vacation packages we can tailor a package to suit your requirements. If you’re looking for a golf break to Ireland, visit our dedicated golf website Tourism Ireland Golf for information on Irish golf courses and the golf tours available to you. You have found a creative Irish inbound team to partner and ensure that your unique Ireland vacation becomes more than just a dream.